Notes: I used the combination of the three source recipes to come up with this recipe. Instead of making my own apple pie filling, I chose to buy the pre-made filling to keep ingredients to a minimum. Take your unbaked cinnamon rolls and cut each into quarters. Cut into 6 or 8 pieces if you are using large cinnamon rolls. Set aside. If you decided to use white bread, cut the bread into 1″x1″ pieces (4×4). Next, make the batter that will be used to soak the cinnamon rolls. Mix the milk, eggs, cinnamon, and vanilla extra in a bowl. Combine the cinnamon roll pieces with the batter. Once soaked, take out the soaked cinnamon roll pieces and mix together with the apple pie filling. 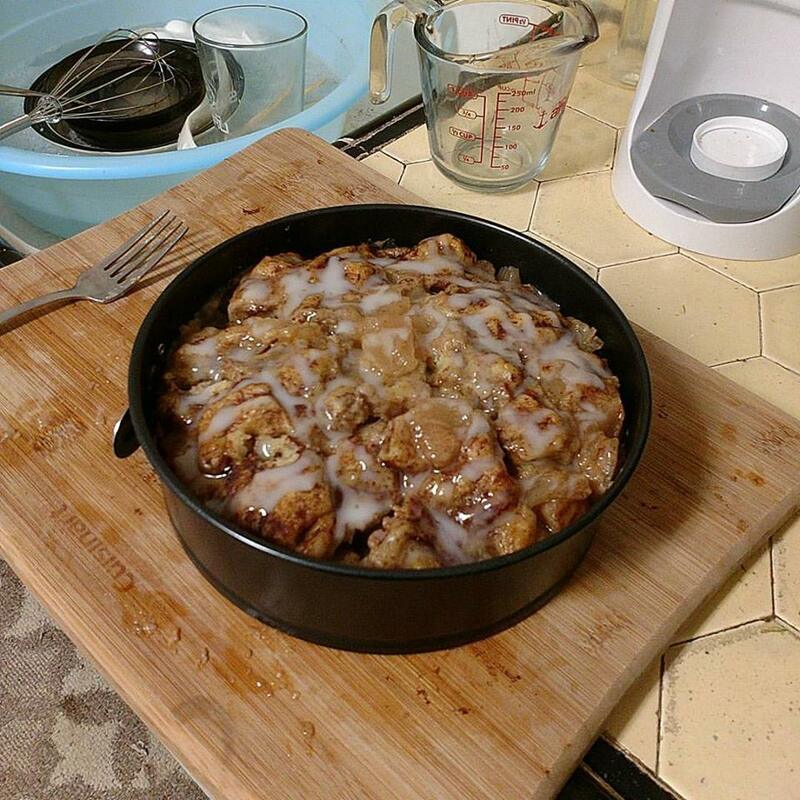 In a greased pan, place the cinnamon roll and apple pie filling combination.Cover with foil. Covering the pan will keep the pudding from becoming soggy during the cooking process. Cook in Instant Pot on Manual for 20-25 minutes. Depending on the size of your pan, you may need to cook for a little longer. After the cooking process is complete, quick release the pressure valve and remove. Top with frosting and/or ice cream and enjoy!